For Halloween this year I decided to dress up as a Little Sister from the video game Bioshock. Not only did I want to dress with the Big Daddy Doll but I also wanted to buy an Adam Syringe. 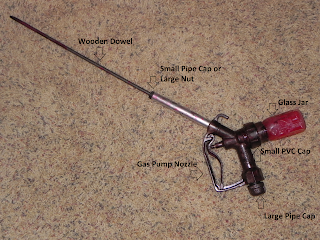 An Adam Syringe is what the Little Sister uses to extract blood (ADAM) from a dead corpse. Small PVC Cap (Hardware Store) You will use this to connect the bottle to the gas pump. Large Pipe Cap (Hardware Store) You will use this to cover the end of the gas pump. Wooden Dowel (Hardware Store) You will use this as your needle. Epoxy (Hardware Store) You will use this to glue certain parts together. After I put this together, I was quite proud of myself. It took me a few days to paint and glue everything together, but it was worth it. 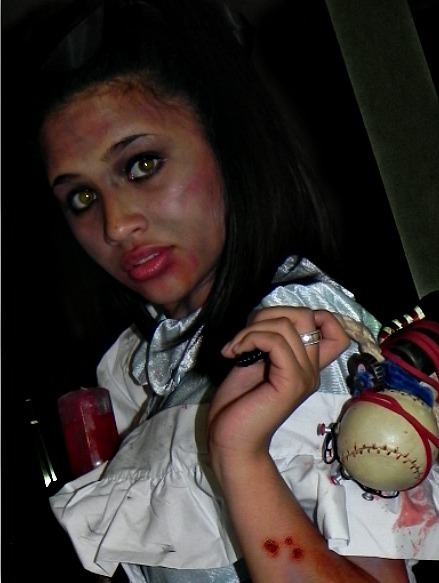 Besides the syringe, I also bought a dress, make-up and colored contacts. Instead of making my own dress I bought an Alice in Wonderland costume and just cut it up and put blood and dirt on it. Overall, this project cost a lot more than I expected but I was happy with the way everything turned out to be. Even though Halloween is over this year, there are always plenty of conventions to go to. And I hope I gave you ladies some ideas for your Halloween costume next year.